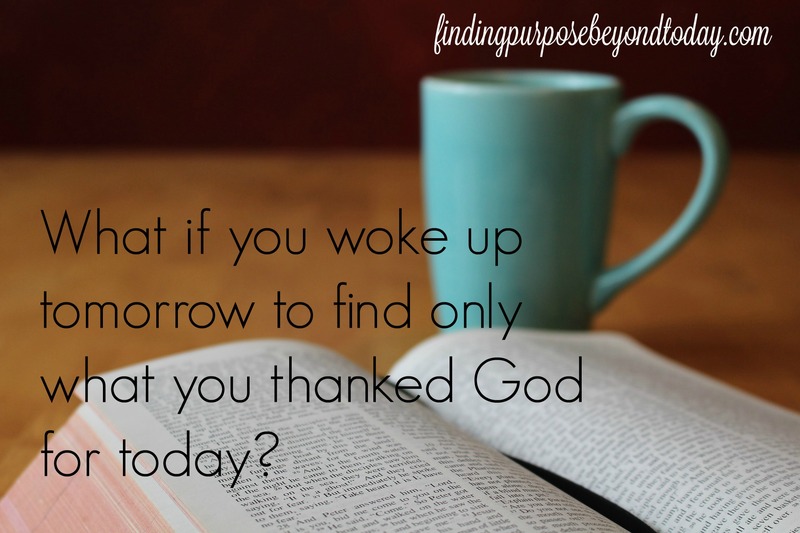 What if You Woke Up Tomorrow Only to What You Thanked God for Today? She paused for a thoughtful moment and then shot this question through the airwaves. It took me a minute to process her query. When I finally understood the question, I ran to my journal, because my brain couldn’t remember what I had written only a few hours earlier. I was thankful that I had written down my prayer that morning. The beauty of ink. Permanent of sorts. Thank you, Lord, for forgiveness. Thank you for that word this week. Thank you for the freedom it brought me. It released me from me. It released me from my own pride and self-conscious pain. It was supernatural how quickly it brought peace to my heart. I’m not sure why except for You. Your ways are mysterious and can’t be explained in the deep places. I was elated to think that if my friend’s question actually came to be, I would have forgiveness. That’s all. It was strange how that thought gave me peace. I would miss terribly the wonderful blessings I have in this world, but I would have the most important ticket to enter the throne room of grace. Thankfully, His forgiveness is not dependent on my daily thankfulness. Mercy and kindness are in His DNA and Jesus has paid the price–I can’t earn it. But I will ponder this question about thankfulness for a few days. I pray I never take any of my blessings for granted. Now it’s your turn. If you woke up tomorrow and found only what you’ve thanked God for today… what would you find? A new daughter, mercy, forgiveness [believe it or not! ], good roads, food, a warm and safe place to sleep, family, marriage, health, vitamins…Happy Thanksgiving Andy! Wonderful Blessings, Denise! Thanks for sharing! Happy Thanksgiving to you too! I love this so much!! I can’t quit thinking about it! Hi Jean! Maybe this was just for you. 🙂 Thanks for sharing it on your blog. Blessings! A positive for aging is I truly realize more every day how much “I” am NOT in control… Being a control freak in the past (and this was not easy for me), I can tell you how liberated I truly feel now. He is my source. He is in control. For everything there is a season. Thanking Him from whom all blessings flow. An example.. I almost left Lifepoint due to lack of energy.. I’ve always been so active.. My Heavenly Father has lovingly put me in my place.. I know His plan for me today… It may change tomorrow..Thank you, Andy, for coming into my life almost daily. Yes He is always “on time”.. Thank you for coming into my life, Janice! So glad you stayed at Lifepoint. Love you much! Thankful for you.